After a long hiatus, a review. This textbook is for teenagers and adults. Life is a 6-level, 4-skills series consisting of a student book, workbook, and teacher’s book at each level. The student book has a DVD with videos, and the teacher’s book contains two CDs with the class audio. The workbook also has a CD for listening-based homework. The series runs from Beginner (A1) to Advanced (C1). First impression: Life is gorgeous. 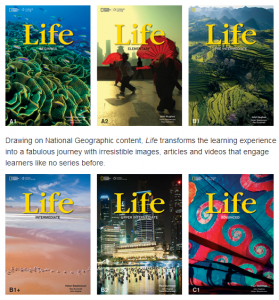 Cengage is really leveraging all those National Geographic photos they have access to, and it is working really well. If you are a Japan-based teacher you will probably be struck by how dense the book is -there is a lot on each page and much less white space than we are used to. Someone described it as a ‘European-style’ textbook, as opposed to ‘Asian-style’. This is a very attractive textbook. The design and production values are very high. There is a lot of content. Each book has 12 units, each unit has 6 sections. We’ve been working through one section per class so far. A really nice variety of topics and media (print. audio, video). There is a lot of variety. Reading, grammar, vocabulary, and speaking exercises on almost every page. The class audio is included in the teacher book. I like this idea a lot, rather than making us buy separate overpriced classroom CDs like many publishers do. It’s expensive. All those production values come at a cost (EDIT: but there is a split edition I haven’t seen that incorporates half of the student book and workbook together). For Japanese students, it’s completely unbalanced. The grammar parts are way too easy, the reading/listening are too difficult. The dense page layouts can be intimidating (just a first impression problem). I really like the series so far. We’re three weeks in and the students like it and are challenged by it, and it’s a fairly intuitive textbook from the teacher’s point of view. We’ve been using the Intermediate level with our ‘advanced’ high school student eikaiwa class, so I’m looking forward to using some of the other levels in due course. Recommended.